We cannot sustainably manage water in an unsustainable world. While there are clearly big systemic and complicated changes that need to be made such as reducing our global population, increasing renewable energy and public transportation, and improving management practices and technologies - we often discount the impact of our everyday personal choices. But the reality is that if we really want to cut our carbon emissions by 50% in 10 years, we can’t wait for these big systemic changes to happen. We need to act now. Environmental water needs often dominate the dialogue on water and the environment, but there is increasing recognition of the benefits nature can provide humans to meet sustainably. 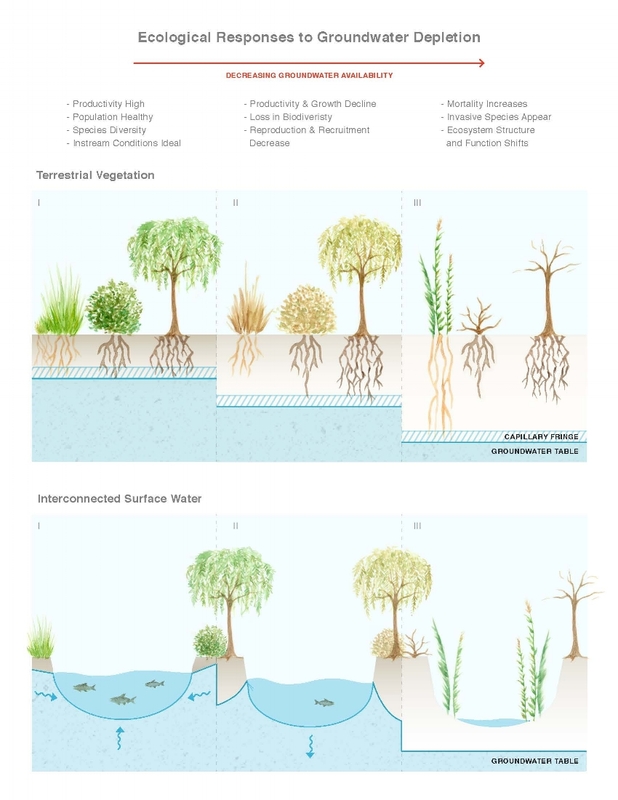 Impacts to species and ecosystems dependent on groundwater. Groundwater is a vital water supply for people and nature. However, species and ecosystems are increasingly threatened worldwide due to rising human water demands. This blog post highlights our recent paper titled "A Global Synthesis of Managing Groundwater Dependent Ecosystems Under Sustainable Groundwater Policy" which was published as an open-source peer-reviewed article in Groundwater. You'll read about how GDEs are managed under sustainable water management policies worldwide and how Australia's management of GDEs provides a blueprint for others to follow. Figure 1. An on-the-ground view of 100+ acres of dead trees found in a riparian forest owned by The Nature Conservancy in the Southern California's Upper Santa Clara River. Photo Credit: Kirk Klausmeyer (The Nature Conservancy), 2016. California's Sierra Nevada aren't the only forest ecosystems at risk of collapse due to the combination of drought and increased temperatures - our riparian forests are in trouble too. Dams contribute more greenhouse gases than we previously thought. Figure 1. Cost comparison of MAR to other water management strategies. Groundwater recharge and storage (a.k.a. Managed Aquifer Recharge) is more ninja than you think -giving local water agencies the agility, flexibility, and even cost effectiveness they need to fight off drought. This blog post highlights the recent findings from our paper titled "Benefits and Economic Costs of Managed Aquifer Recharge in California" which was published in the open-source peer-reviewed journal San Francisco Estuary & Watershed Science last week. You'll read about how managed aquifer recharge is 5 times cheaper than other water storage strategies and can be used to convert flood risk into a resource. Hi-yah! Research by Water in the West indicates that that groundwater storage is one of the more cost-effective ways to deliver public benefits and provide long-term reliability to California’s water infrastructure. Although surface water storage still has an important role in California, the California Water Commission should not set up an application process that does not take full advantage of the public and economic benefits of groundwater storage. A local priest takes a measurement at a well outside his temple using an electrical conductivity meter. EC meters can be used to monitor groundwater and enhance routine groundwater monitoring in fractured hard rock aquifers. Sustainable Water Use: How do we measure success? India is positioned to be the most populous country in the world by 2022. But how will rising food demand impact dwindling groundwater supplies? Is there a way we can monitor how much water can be sustainably taken without impacting food production? Prioritizing how we use water in California requires some reflection on our cultural heritage. America is not really a melting pot, but a myriad of distinct geographic cultures that directly link back to the first settlers that pioneered the land. North Korea is widely perceived as a nuclear threat to the international community, but what if imposing economic sanctions on North Korea actually meant that we were inadvertently inflicting a threat on global health security? How much water storage capacity can California gain with $2.7 billion? This November, Californians will vote on Proposition 1 and decide whether $7.5 billion in bond funds will be available for water. Although the amount has been settled, there are still room for discussion on how best to utilize these funds. There are lessons to be learned from the on-going conflict in Syria on how we can better manage water here in California. Trouble is brewing over the Pacific for the Indian monsoon, and farmers may be faced with water shortages in the upcoming year. There is a potential link between the California drought and flooding events in the UK this year. There are no silver-bullet solutions for combating water stress, but there are ways that we can offer a more centralized source for disseminating best management practices and decision-support tools that can help guide local decisions to move in the right direction. Just like trees, communities also have their roots set in place and they both depend on water. California and India have more in common than you think. Exploring the opportunites and tradeoffs with surface and groundwater storage options for California.